Not many people know this, but the newly appointed Deputy Chief Whip in the coalition government is a birder. He is John Randall, known to his closest friends as Alex. He’s an old chum of mine and was even best man at my first wedding, many years ago now. In those days, he used to lead a few birdwatching tours to places such as Hungary and Poland, and at that time I too was a Birdquest tour leader, in my pre-publishing days. We all had fewer commitments then before marriage and families intervened and we were free to travel to exotic destinations to watch birds. Alex was elected as MP for Uxbridge in 1997, in a move that surprised even his closest friends. Since then he has diligently worked in the whips office in opposition, with rather little time for birding, though he does manage to get away on a few family holidays (for example a trip to Borneo last year with one of his sons). I won’t bore you all with tales of lunches in the House of Commons, but Alex did send me the photo below recently. 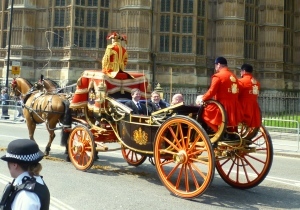 He’s on his way to the State Opening of Parliament (no, he doesn’t travel to work like that every day!). Apparently one of the perks of his new job is to ride in this fancy coach behind Her Majesty. How the other half lives! 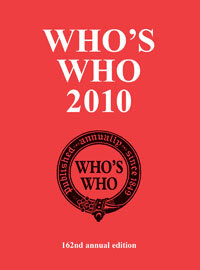 To find out more details about John Randall, check out his entry in the latest edition of Who’s Who.